FINAL COUNTDOWN TO E-DAY - MAKE YOUR VOTE COUNT! Now we're in the final week of Election campaigning, an interesting development in the jostling over provision of a safety net for our 'new unemployed' towards the end of last week was that of John Key as 'the money market man with a heart'. To which Helen Clark's response was "There's no such thing as compassionate conservatism. We've got no history of it in New Zealand." At least the word compassionate has become a key word - let's hope it isn't lost in translation! On last Monday night's minor parties debate on TVNZ it was good to note that child poverty was highlighted several times. All six minor parties who took part in the debate agreed that poverty (and related issues) was on the Election agenda. It was good to see Mark Sainsbury quoting the recent OCC and Barnardos Fair Go report statistic that over 200,000 NZ children live below the poverty line. The parties most vocal about child poverty are the Maori Party and the Greens. A mixture of policies have been put forward to alleviate poverty for families including the reintroduction of a universal child benefit, raised benefit levels, and increases in the minimum wage to $15 per hour. The Greens are advocating for beneficiary families to be entitled to the In-Work Tax Credit under Working for Families and the Maori Party is calling for the elimination of child poverty by 2020 as well as the establishment of an official povertyline – at 60% of median household income (after housing costs). The Labour government has also made the commitment to continue to increase the minimum wage. Adjustments to the earnings thresholds before benefit abatements kick in has also been announced. However, the first $20 earnings adjustment is not scheduled until April 2010. To hear about the latest policy positions from John Key and Helen Clark check out the next leaders debate tonight (5 November) on TV 1 at 7pm. Those of you interested in developments in the aged care sector will be aware that both Labour and National have made recent funding announcements. National announced an $18 million commitment by the National Party to support and retain aged-care nurses and the party's $5 million commitment to increase respite care in a recent press release. The new funding was welcomed by Healthcare Providers NZ whose Chief Executive Martin Taylor said the policy would stabilize the sector in 2009 and provide "policy makers a window of opportunity to plan how we as a nation can avoid a pending crisis in care for our elderly". A couple of days later the Minister of Health David Cunliffe also announced more funding for the sector - an immediate $13 million injection to jump start the reform of the Aged Care Sector in a press release of 21 October. Healthcare Providers NZ has pointed out in a press release that only $8m of the $13m is new money $5m is money that DHBs didn't distribute "when they were given a 3.3% increase for aged-care inflation and only passed on 2.2%. The remaining $8m is for aged care workforce development. Issues for rural aged care services have also been highlighted by Healthcare Provider NZ. Changes to the way Aged Residential Care (ARC) facilities are audited are also planned. Among issues included are dealing with the issue of multiple audits of service providers but also removing choice over the Designated Audit Agencies (DAAs) who perform audits (providers will continue to pay for this service), introducing random or unannounced audits, witnessed audits, independent expert auditing of DAAs and making summaries of audits available on the internet. A Ministerial Aged Residential Care Workforce Action Group is to be established and tasked with providing the (new?) Minister with advice on higher levels of more qualified staff and management, a detailed qualifications structure for the sector and a 5-year plan for safe staffing levels linked to qualifications. The group is expected to convene as soon as possible, produce a draft report by March 2009, final report by June 2009. The group is intended to be a small advisory group to the Minister providing advice and options and not acting as sector representatives. For more information about these announcements contact Paul Barber at NZCCSS paul.barber@nzccss.org.nz 04 4732627. In this year's Budget $446m was put aside to assist providers of essential services to support vulnerable children, young people and their families. To be implemented through the Pathway to Partnership policy, this funding is starting to be rolled out. Whilst there is broad sweeping support for increased funding for family support services not everyone has been happy with the process to date. For more information check out the press release by the Child Protection Studies (CPS) and the press release from ANZASW. NZCCSS has released a media statement calling for a cross party commitment for funding for social services. Last week the Paediatric Society of NZ held its Annual Scientific meeting on the very topical issue of improving child outcomes. Run in Waitangi over the last four days of October, issues being discussed inlcude child protection and the prevention of abuse, health inequalities, B4school checks, youth health - to name just a few. As many of these issues relate to our watching brief on Child and Family Policy we'll keep you posted on developments from this meeting. Statistics NZ has recently released the Food Price Index September report. Food prices between September 2007 to September 2008 have risen by 10.8% - the highest annual increase since April 1990. In a recent press release the Salvation Army reports that increases in food, housing (rents and mortgages) power and other necessities are a grim reality for New Zealand's forgotten families. The Salvation Army reports a 13% increase in the demand for food parcels in the 2007/08 year compared to the year before. 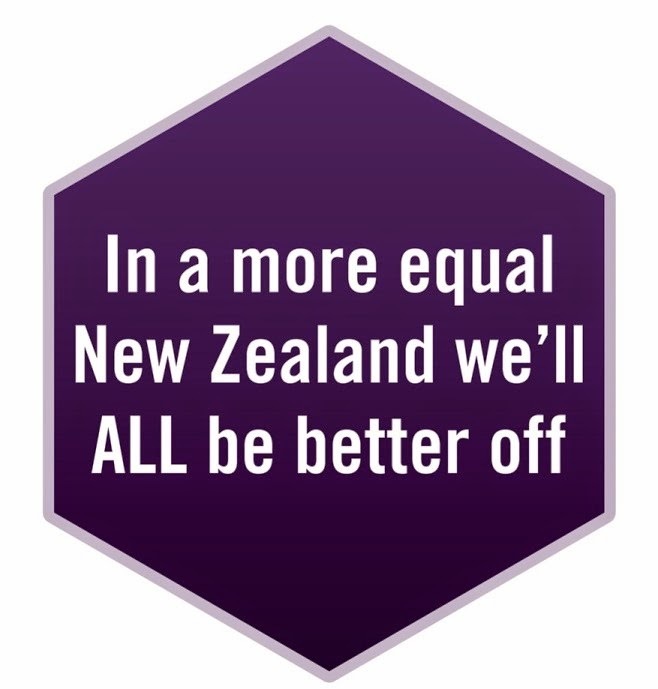 In a NZ Herald article last week it was reported that New Zealand and Finland were the only two OECD countries to show a significant increase in income inequality between mid-1980 and mid-2000 according to a recent Growing Unequal OECD report. Data in the latest Social Report on income inequality shows that this gap is starting to narrow. A range of policies have undoubtedly helped to reverse the trend including the Working for Families package, higher minimum wage, paid parental leave, flexible working hours and improved support for early childhood education. CTU economist Peter Conway is quoted in the NZ Herald article "the momentum must continue in these difficult economic times - particularly through support for decent jobs". As he succinctly states "the policies of the late 1980s and 1990s were a disaster for low income families". One of the most telling statements in the report was the comment by the OECD Secretary General that "it was a myth that inequality encouraged peple to try to do better, or was conducive to economic growth". OECD research shows that countries with high inequality have lower social mobility. Perhaps governments should be mindful of this when designing a welfare system that creates huge income equalities. Tapu Misa also makes some interesting observations on the OECD report in her column of October 27.